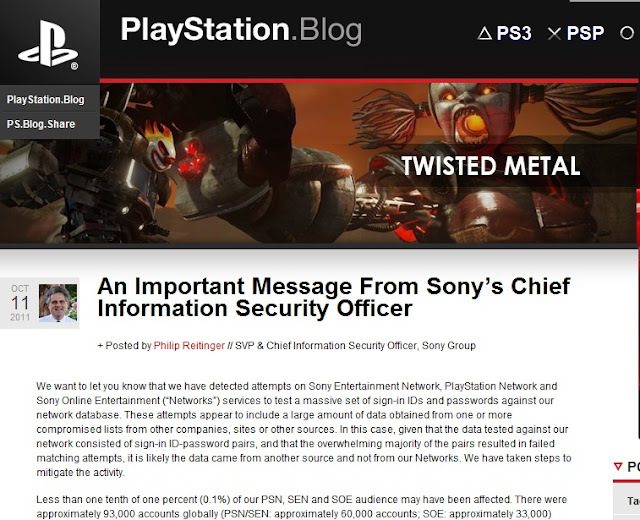 Sony has warned users against a massive bruteforce attack against PlayStation and Sony network accounts. The attack - which used password and user ID combinations from an unidentified third-party source - succeeded in compromising 60,000 PlayStation Network and 33,000 Sony Online Entertainment network accounts. These accounts have been locked and passwords reset. The attack took place between October 7 and 10 and succeeded in matching valid sign-in IDs. According to a blog post by Philip Reitinger, Sony's Chief Information Security Officer, credit card details were not compromised. Both the motive for the latest attack against Sony network users and the identity of the perpetrator(s) remains unclear. Sony shut down its PlayStation Network in April in the aftermath of a far more damaging hack attack. The service wasn't restored until a month later. Personal information on 77 million account-holders was exposed as a result of the April PlayStation hack. Details including names, addresses, passwords and purchase histories was exposed by the megahack. The content of This News Sony hacked again - 93,000 accounts compromised with brute-force attack and Other Information is provided by Various Sources (Emails, Messages, etc..) for Educational Purpose & Security Awareness only. If any Law Enforcement Agency or Related Company needs Information, Please Feel free to Contact Us. Thank You !